Survey Statistics: Who Is Most Likely to Get Approved for Social Security Disability Benefits? It's not easy to get SSDI or SSI, but our survey highlighted several factors that can increase your chances of being approved for benefits. How hard is it to get Social Security Disability Insurance (SSDI) or Supplemental Security Income (SSI) benefits if you have a serious medical condition that makes it hard for you to work? We surveyed readers across the U.S. who recently went through the process of applying for SSDI or SSI to learn more about their experiences. Here’s what we learned about the outcome of their disability claims, as well as some of the things that made a difference in their chances of success. As anyone who’s been through the process will tell you, it isn’t easy to get Social Security disability benefits. Our survey backed up that general impression. 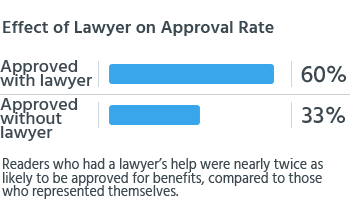 Overall, only about four in ten (42%) of our readers were ultimately approved for benefits. Of course, the outcome for your individual claim will depend on whether you meet the medical and other eligibility requirements. Still, many people who sincerely believe they’re too disabled to work aren’t able to get benefits. Are there certain characteristics or circumstances that make some claims more likely than others to be approved? Our survey confirmed what you might suspect: It's easier to get benefits for some medical conditions than others (see our survey results on disability approval rates for common medical conditions). But the results also pointed to other, less-obvious factors that make a difference. "Go to your doctors, do all they ask, and follow up with your specialists. Have witnesses who can speak to the limitations your health issues create. My attorney helped make the process smoother and less stressful." Few applicants make it through both of these stages successfully. In fact, more than three-quarters (77%) of our readers told us their applications were denied at the initial application level. It's worth pointing out that these results included technical denials as well as denials based on medical eligibility for disability benefits. According to government statistics from 2017, many people receive technical denials: 47% for SSDI applicants and 23% for SSI. Taking those numbers into account, approval rates at the application level based on medical eligibility alone are higher: 49% for SSDI and 41% for SSI. This means that applicants who meet the nonmedical requirements of SSDI or the financial requirements of SSI have a better chance of winning benefits. The strength of your medical evidence is critical for proving your claim. Clearly, you should see a doctor or other medical professional in order to create that evidence. One-third of our readers said they had not seen a doctor or other medical professional in the year before they applied for disability. Not surprisingly, these readers were much less likely to receive benefits (21%) as those who had seen a doctor (46%). If you don’t have a history of recent medical visits, you might be able to prove you had a good reason for not seeing a doctor (for instance, because you didn’t have insurance and couldn’t afford it), but the odds are against you. 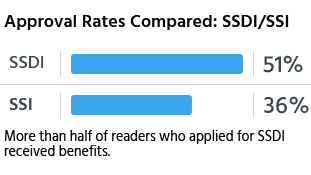 About half (51%) of readers who applied for SSDI were ultimately approved for benefits, compared to just over a third (36%) of SSI applicants. (For details, see our articles on the outcomes for SSDI applicants and outcomes for SSI applicants.) Our survey pointed to several factors that could account for this difference in outcomes, including the fact that SSI applicants were less likely to hire a lawyer (35%, compared to 49% of SSDI applicants) and were more likely to be women (more on those factors below). Some of our readers were still working when they filed their SSDI or SSI applications. 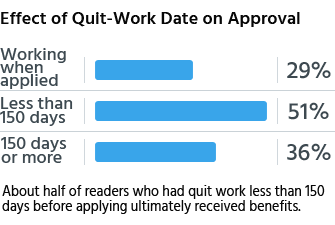 Less than three in ten (29%) of those applications were approved for benefits, compared with more than five in ten (51%) of those who had quit work within the five-month period before applying. This isn’t surprising, since applicants who are working over the limit that Social Security allows are instantly denied. Even if you’re earning under the allowed amount, it can be much harder to prove that you’re disabled if you’re doing any work. 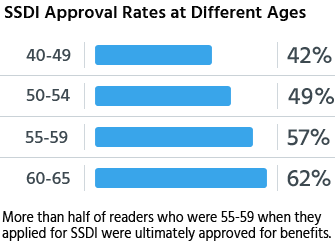 Our survey revealed an upward curve in approval rates for SSDI from younger readers to those in their sixties. About half of readers age 50 or older were ultimately approved, while nearly two-thirds of those in the 60-65 age group received benefits. Social Security recognizes that people in their fifties and sixties are more likely to have medical conditions that have deteriorated to the point where they can no longer work, and Social Security’s “grid” rules support this reality. Our survey revealed a gender gap in the approval rates for men and women. 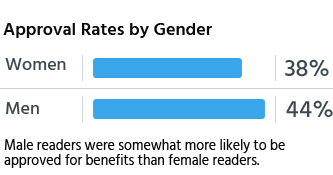 Nearly five in ten (44%) male readers saw their applications approved, while less than four in ten (38%) female readers had successful outcomes. The types of medical problems that men and women experience may explain at least some of this difference. Compared to men, a higher percentage of women had mental conditions or musculoskeletal impairments, such as knee and joint problems (67% for women and 60% for men). In general it’s harder to get approved for these types of problems. Also, men were more likely than women to suffer from respiratory problems, injuries, and cardiovascular disease—all of which have higher-than-average approval rates. Finally, our female readers were somewhat more likely than the men to have applied for SSI—14% of women, compared to 11% of men. (Women are less likely than men to be insured for SSDI; almost 80% of men are insured for SSDI while only about 70% of women are insured, meaning they’re more likely to have to apply for SSI.) 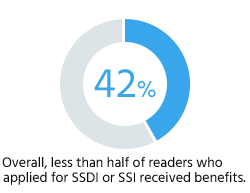 As we’ve seen, SSI applications have lower approval rates than SSDI. Applying for Social Security disability can be a complex, lengthy, and frustrating process—one that’s made even more difficult by the fact that you’re probably dealing with money problems along with your medical issues. But our survey results should offer some hope as well as strategies to tilt the odds in your favor: See a doctor if you can. Don’t give up if your application is denied at first. Do what you can to show that you tried to work but your disability stopped you.